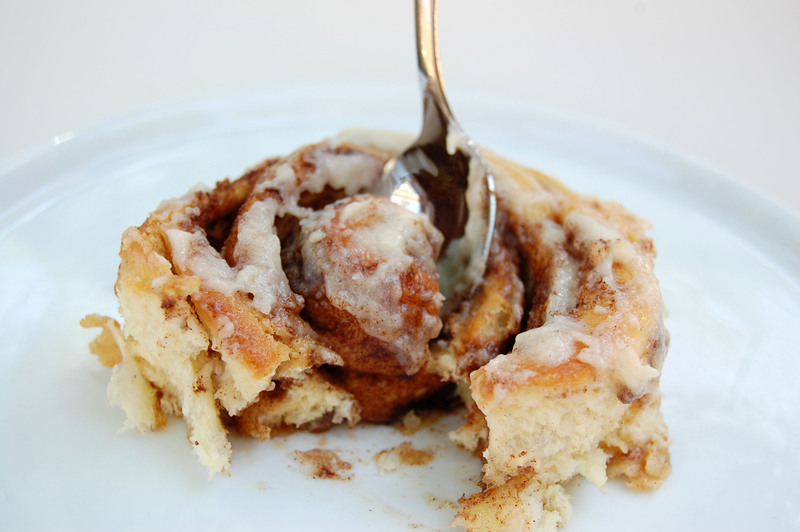 did you know that cinnabon sells a cup that’s full of exclusively ‘the center of the roll?’ it’s a nice concept, but i think it’s important to experience the anticipation of slowly pulling back the outer layers, the dough getting increasingly pillowy and gooey with filling until hitting the jackpot in the middle. the filling in these rolls is enhanced by fragrant cloves and honey, which marry beautifully to the brown sugar and cinnamon and result in a sticky glaze on the bottom. the cream cheese frosting soaks into the nooks and crannies of each spiral, adding tang and moisture. these take about four hours from start to finish. i would recommend waking up early and making them for a big sunday brunch. the recipe can easily be halved for a smaller crowd, but keep the proofing times the same. combine the sugar, egg, yeast, and 1 cup of flour in the bowl of a stand mixer. microwave the milk and butter together in a glass measuring cup until the butter is melted and the mixture is between 120º and 130º. add into the mixing bowl. beat on low speed for three minutes. add the remaining flour, and beat until incorporated. if the dough is too sticky, add more flour (it probably will be). beat until the dough pulls away from the sides of the bowl and forms a ball. turn onto a floured work surface and knead for eight minutes. form into a ball. spray a large bowl with nonstick spray and add the dough, turning to coat. cover with plastic wrap and a kitchen towel and let rise in a warm area until doubled in size, about two hours. mix the brown sugar, cinnamon, and cloves together in a small bowl. punch the dough down and roll it out to a 15×11 inch rectangle on a floured work surface. spread it with the butter, leaving a half inch border. sprinkle with the brown sugar mixture, and drizzle with honey. starting at one of the 15 inch long sides, roll up tightly into a log. with a sharp knife, cut crosswise into eighteen slices. spray two 9×9 pans with nonstick spray and line with parchment paper. divide rolls between the pans, arranging them cut-side up in rows of three. cover with plastic wrap and kitchen towels and let rise in a warm area for 45 minutes. 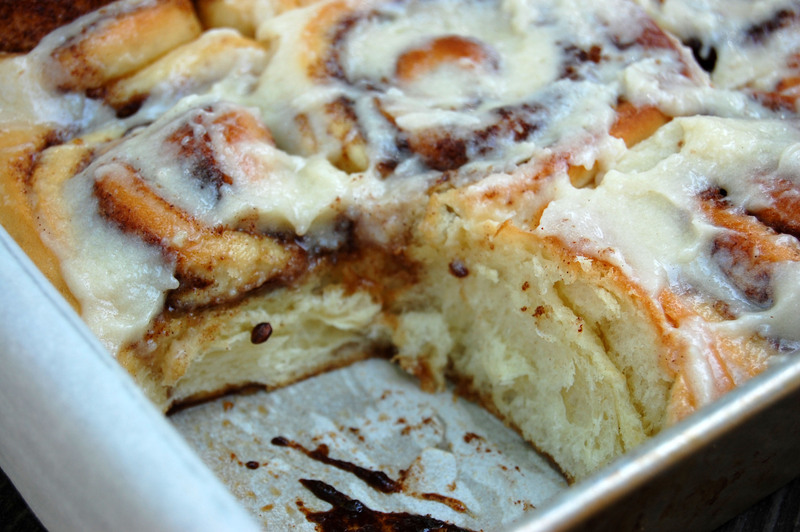 for the frosting, combine all ingredients and beat until smooth. preheat oven to 375º. bake rolls until tops are golden brown, about 15-20 minutes. 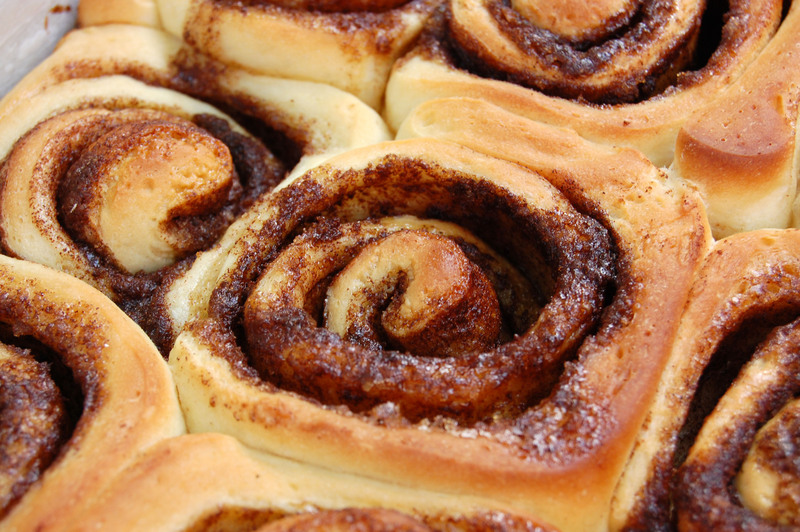 if the centers of the rolls pop up while baking, just gently push them down after removing them from the oven. 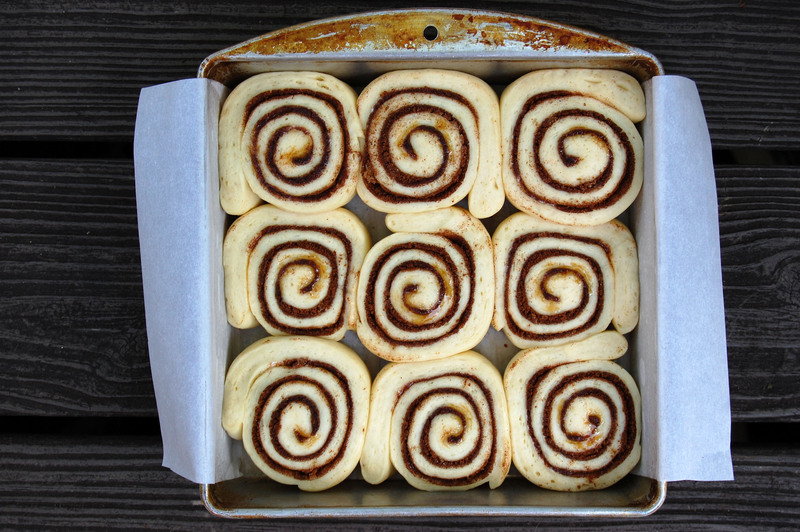 let cool in the pans for 10 minutes, then spread with frosting. 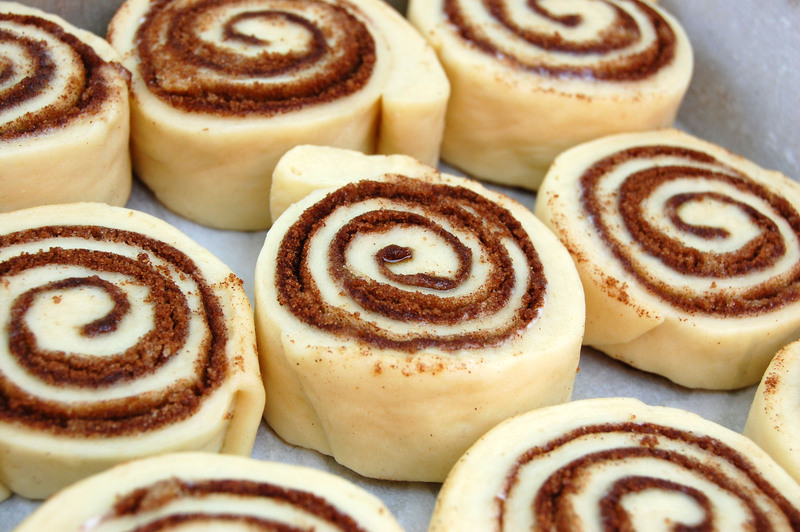 eat immediately – after a few hours, these get dry-ish and the frosting hardens. if you wish to reheat them, cover the pan with aluminum foil and put into a 400º oven for 3-5 minutes.